Scientists are trying to save Puerto Rico's endangered Amazon parrots after Hurricane Maria destroyed the birds' habitats and food sources. El Yunque is a large national forest on the eastern part of Puerto Rico. Just two of the 56 wild parrots that once lived there survived Maria. The Category-4 storm struck Puerto Rico in September 2017. Scientists report other forests have seen great drops in parrot populations, as well. 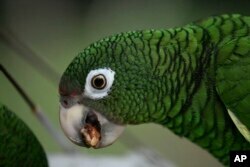 In the 1800s, there were more than a million of the bright green parrots living in the wild in Puerto Rico. By the 1970s, the number was down to just 13 birds after years of forest clearing. The U.S. and Puerto Rican governments launched a special program in 1972 to help increase the parrot population. That led to the creation of three breeding centers. Just weeks before Hurricane Maria hit, scientists counted 56 wild parrots at El Yunque. That was the highest number in the program’s history. Scientists say that even though several parrots have been born in captivity and in the wild since Maria, the species is still in danger. The Puerto Rican Amazon is the island's only remaining native parrot. The birds only reproduce once a year. More than 460 of the birds are kept inside the breeding centers at El Yunque and the Rio Abajo forest. Scientists have not released any of the birds since Hurricane Maria. A third breeding center, in a forest in the western area of Maricao, has not been in operation since the storm. Federal and local scientists plan to meet next month to discuss how best to bring back the species. Scientists are considering whether to capture some of the remaining wild parrots and put them in the same cage as the birds that are set to be released. This way, the captive birds can learn from the wild birds how to survive in the forests. 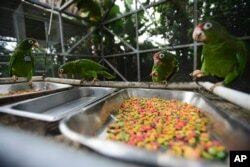 Another consideration is to release some captive parrots in Maricao, which was not as heavily damaged by Maria. But first, scientists need to make sure the forests can offer food and safe shelter for the birds. 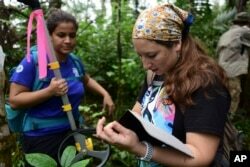 Jessica Ilse works at El Yunque for the U.S. Forest Service. She says scientists are studying the amount of fruit falling from trees and the number of leaves the trees have dropped. Many of the large trees where the parrots used to build nests are now gone. Without these trees, the parrots could become easy targets for their predators. Hai Do adapted this story for Learning English based on Associated Press story by Danica Coto. Ashley Thompson was the editor.